Stock status is current as of 4/25/2019 6:44 AMET. List Price:$.00Click to See Price in Cart! Tap into the power of your Mac or PC by connecting it to Wacom Cintiq Pro with Wacom Link Plus. You have three options: For up to 3840 x 2160 resolution (UHD) use either USB-C cable alone, or Mini DisplayPort and USB-A together. 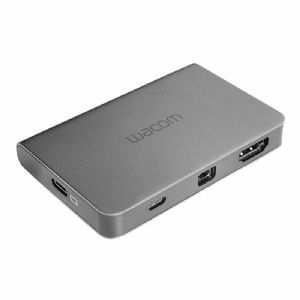 Alternatively, connect to your HDMI and USB-A ports with a high speed HDMI cable for up to 2650 x 1440 resolution (QHD). Lastly, connect your Cintiq Pro power cable directly to the Wacom Link Plus for a one-cable solution to your Cintiq Pro display.